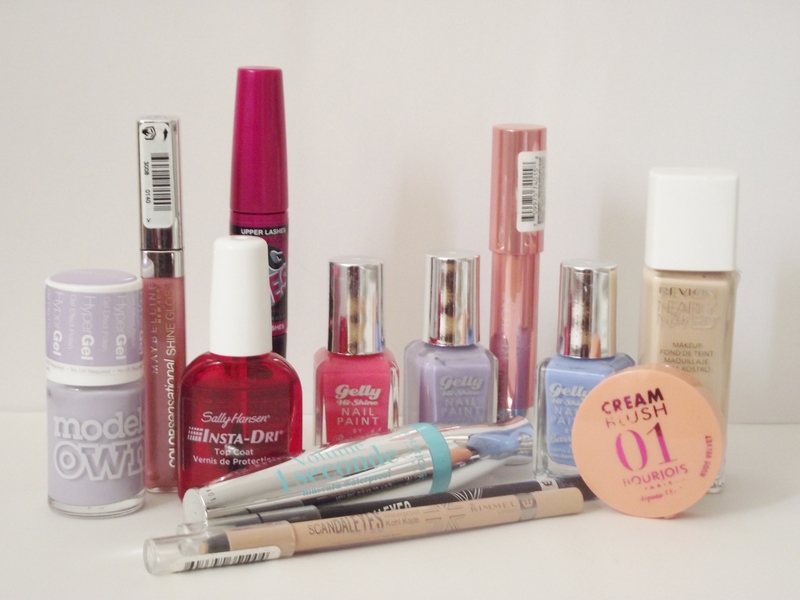 There are so many products available under £10 in Boots and Superdrug so it can difficult deciding what products to buy. So, I thought I would give you a bit of help with some of my personal favourites. In terms of base makeup, there isn’t many cheaper foundations I like because the foundations are always too dark for me or too cakey, however, Revlon Nearly Naked is really good, it’s perfect if you want light coverage and a natural finish and the shade range is great. I don’t wear blusher everyday because I’m a little scared of it but when I do I tend to go for cream over powder and the Bourjois Cream Blushers are just lovely, they blend really easily and they look natural. I think the drugstore is amazing for mascaras. The Bourjois One Seconde Mascara gives amazing volume and definition and it lasts all day without flaking or smudging. The Maybelline Big Eyes Mascara is a dual ended mascara, a wand for the upper lashes and a mini wand for the bottom lashes. I love this mascara because it gives amazing curl and volume and the two wands means it coats every lash. My favourite drugstore liners are the Rimmel Scandal Eyes Waterproof Kohl Liners, they last all day without smearing everywhere and I think they make a good dupe for the super expensive Nars liners. For lips, I love the Maybelline Sensational Shine Glosses. If you’ve wanted to try the Clarins Instant Light Lip Perfectors, get one of the Maybelline glosses because the formula and finish is incredibly similar. I also really like the Revlon Lacquer Balms, everyone talks about the matte versions but I look awful in a matte lip so I love the glossy finish. For nail polishes, I don’t think you can go wrong with Models Own and Barry M. Models Own are always launching new shade ranges and finishes of nail polish. The original formulas are great and if you like scented polishes, check out Peach Melba and Coconut. I know the Hyper Gel range got really mixed reviews but I really like them and I have about six and I’ve had no problems with them. Barry M Gelly polishes are also amazing, these are my favourite shades, Blueberry, Prickly Pear and Grapefruit. I have loads of the Gelly finishes, I think they’re fantastic. If you’re looking for a new top coat, I think the best drugstore top coat is the Sally Hansen Inst-Dri top coat. It dries super quick to a really glossy, shiny finish and it doesn’t chip almost instantly, like some fast drying top coats (Sech Vite, I’m taking about you!). What are your favourites under £10? The Bourjois Cream Blushes are amazing – I really love their newest 05 Pink Sunwear, it’s such a gorgeous colour! I’m so keen to try the Barry M Gelly polishes and I’m with you on appreciating the Blueberry shade – how cute!! You have some lovely nail polishes in your collection. I love Barry m! My favourite brand is seventeen at the moment they are great for under £10!